Franklin-Christoph is one of the trending pen manufacturers for the moment. Especially if you're active on Instagram, you must have noticed the FC 'hype' that has been going on for a while now. 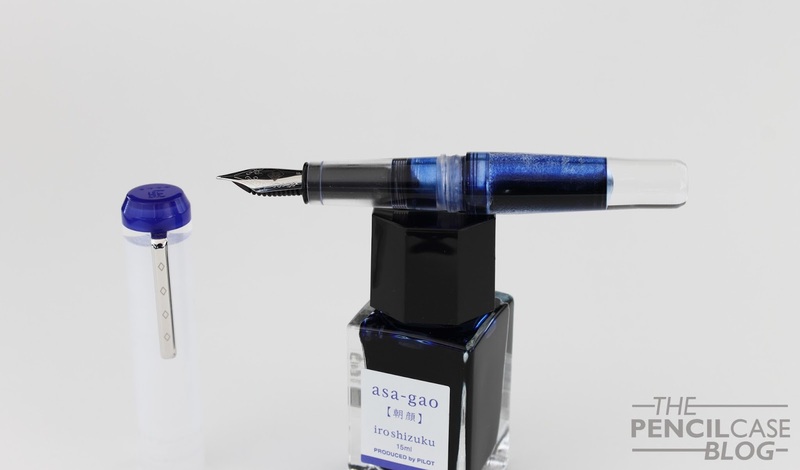 Franklin-Christoph is one of the bigger players on the American fountain pen market. 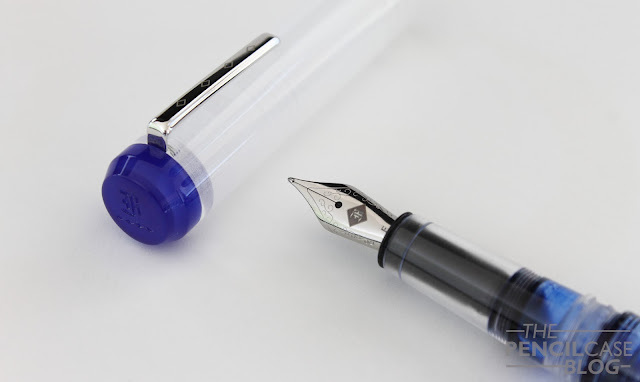 They manufacture a wide range of fountain pens and other writing utensils -but mostly fountain pens- with a unique and immediately recognisable character . I'm always willing to try new products from different brands. So when Massdrop gave me the oportunity to try out this Pocket 40 ice, I immediately said yes. Basically, I was sold the moment they mentioned the 'ice' finish, because part of Franklin-Christophs immense success is based on that very pen and finish! 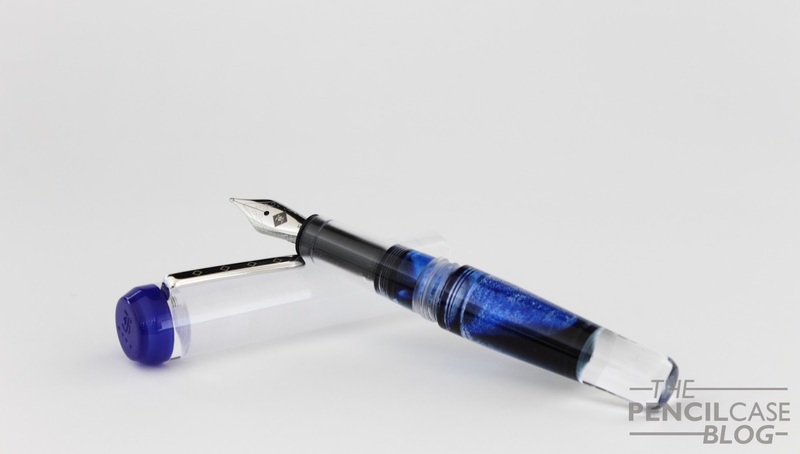 The particular model Massdrop sent me is the Ice&Blue-Violet, which is a Massdrop exclusive for now (it's supposed to become a standard edition in the future), there's also an inverted color option: Blue-Violet&Ice, which features a blue barrel and cap, but with a transparent acrylic section and fineal in the Ice finish. Thanks to the generosity of Massdrop, I'll be giving away the Pocket 40 Blue-Violet&Ice, details about that can be found in this post! The pocket 40 is of course... a pocket pen! It's probably one of their most well-known pen models, due to it being (one of) the first models that featured the Ice finish. But what is this so-called 'Ice' finish exactly? Well, because these are all-acrylic pens, a lot of people use them eyedropper-filled. Of course having a demonstrator pen eyedroppered is awesome, but the folks over at FC went beyond that, and added a custom, rough finish to the inside of the barrel and cap. This texture adds a lot of visual interest to the pen, with ink sloshing around inside, that gets stuck on the texture. The pocket pen on itself is remarkably similar to a Kaweco sport when it comes to the general form factor. Large cap, small body. Other than that, it follows a completely different design philosophy. It's a bit chunkier, and a touch longer. It doesn't show that much, because it's a demonstrator, but the design is actually quite funky. Of course the Kaweco Sport also looks 'odd' in a way, but the pocket 40 has even more exaggerated proportions, which give it a unique look. 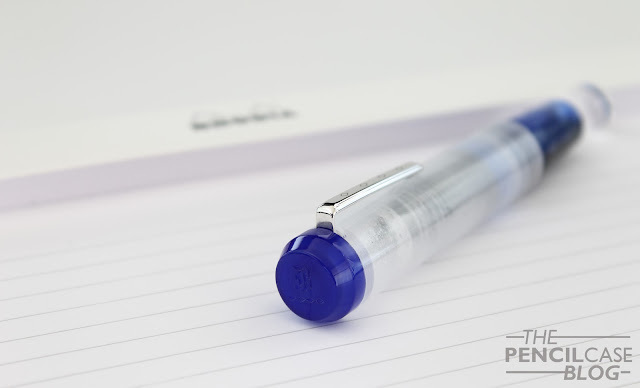 Closed, the cap is of course the most prominent part of the pen: It's a straight cillindrical shape, and has a blue fineal with a beveled edge (a trademark on all Franklin-Christoph pens.). It has a very small internally attached clip, unlike the Kaweco (sorry, I can't help comparing it to the Kaweco Sport), that actually works better than I expected based on the way it looks. The barrel has a pronounced curvature towards the back, where it gets narrower to allow for the cap to post. The combination of clean beveled edges and straight lines makes the Pocket 40 a very interesting pen to look at, conservative but modern at the same time. But of course, there's also that Ice finish inside the cap and barrel. It's -as I said- one of the reasons this pen got so popular, and I can see why. It's a strange finish, it looks as if FC was lazy and decided to not polish the interior bits of the pen. Yet as you look closer, the 'grain' of the ice finish is much more uniform than it would be if it just came straight of the lathe. However, I still would've preferred it to be slighty more uniform across the pen. In my pen, the cap has noticeable machining marks, but I did some research and it's supposed to look more even across the board. I suspect my copy might have been an early prototype for this Kickstarter-exclusive Ice&Blue model, so that would explain the more irregular finish. Sizewise, the pocket 40 really is a true pocket pen! 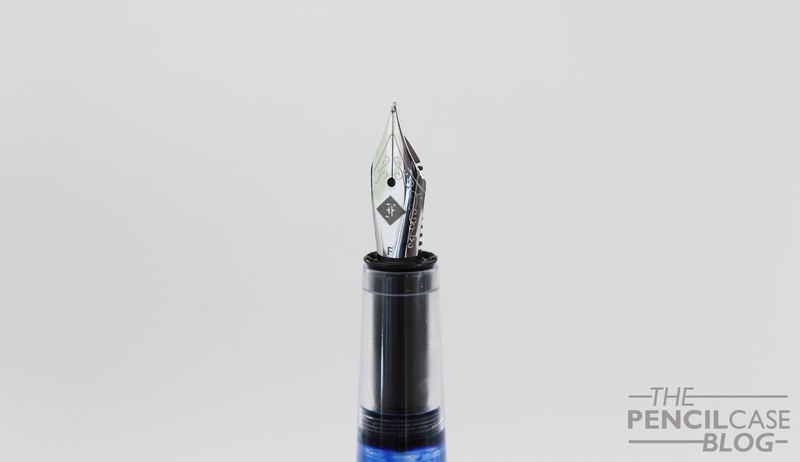 Compared to something like the TWSBI Diamond Mini, it looks tiny! On the other hand, it's marginally bigger than the Kaweco Classic Sport, at 10.7cm closed (4.21 In), and just 9.6cm open (3.78 In). 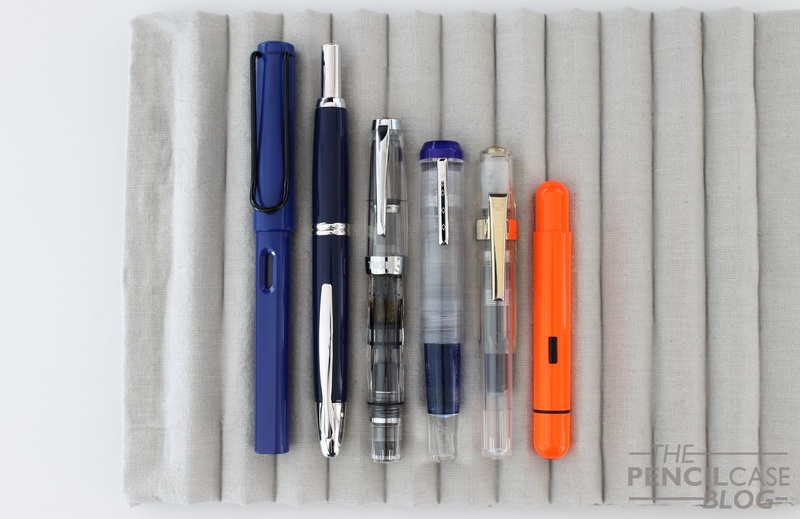 Of course it's meant to be posted, which brings it in at 13.2cm (5.2 In), which is just a fraction longer than, for example: a Lamy safari unposted. It's a fairly beefy pen because of the cap, but around the grip section it's a fairly average and comfortable 9-10mm wide. There are two drawbacks to the Pocket 40 though: First off, I'm not a huge fan of how it posts. It's actually quite an annoying flaw, because posting on a pocket pen is quite a big deal. The cap sits quite far down, but it feels like the barrel should have been slightly less tapered, so that there wouldn't be as much lateral play on the cap, which causes it to loosen and come off. It's quite annoying when the pen falls apart in the middle of a sentence, and unfortunately it happened quite a lot during the past few weeks. 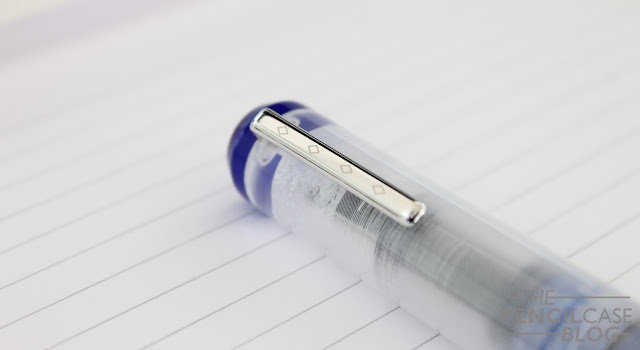 The second issue would be the uneven ice finish in the cap of this particular pen, but as I said before, it should just be a one-off problem. Despite the posting issues, it's a really comfortable pen to use. It's light, and the cap doesn't weigh it down. The section has a taper towards the nib, but doesn't have a particularly ergonomic shape. Nevertheless, it's comfortable to hold, the section is long enough so you don't have to place your fingers on the threads. But even so, the block threads are almost not noticeable during use, unless you really rub your finger over them. Being the Ice version, I obviously eyedropper-filled it to see the effect it creates. I just used some TWSBI silicon oil to seal the threads, and it held up just fine, however for longer use I'd recommend getting a more viscous silicon grease. The pen cleans fairly well, despite the tricky surface on the inside, but a faint hue of the ink remains visible when you just flush it out with water (Maybe an ultrasonic cleaner, or some pen soap or pen cleaning solution might get rid of that, but it didn't bother me to the extent that I cared to try). On to the nib! 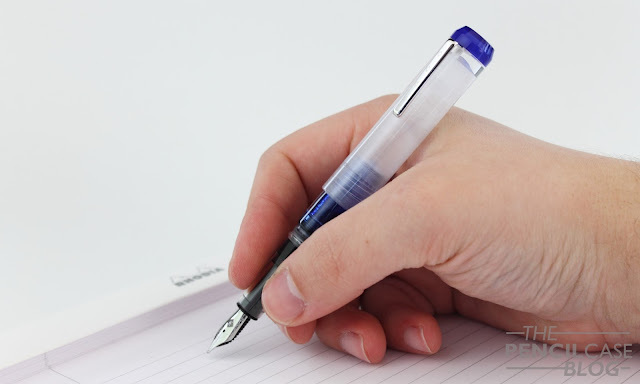 Being a smaller pen, it utilises a smaller, #5 sized nib. It has some scrollwork and a laser-etched FC logo inside a diamond shape (the diamond shape can also be found on the fineal and the clip). As always, I'm not a huge fan of laser-engraved nibs, but it looks clean so I won't complain. The nib performed close to what I would call perfect, right out of the box. It's quite a wet writer, consistent throughout. It gives some feedback, but I'd consider that normal for a fine nib. It's also a 'true' fine, perhaps a bit outside my comfort zone (which is broad nibs), but really pleasant for everyday writing tasks. It's a steel nib, so of course it's quite rigid. There's always the option to go for a gold nib, or get a Masuyama nib grind directly through Franklin-Christoph (These options aren't available through Massdrop). As for where to buy this particular model and finish, for now you'll have to wait for the Drop on Massdrop to restart, which can acchieved through requesting a re-launch on the drop page. 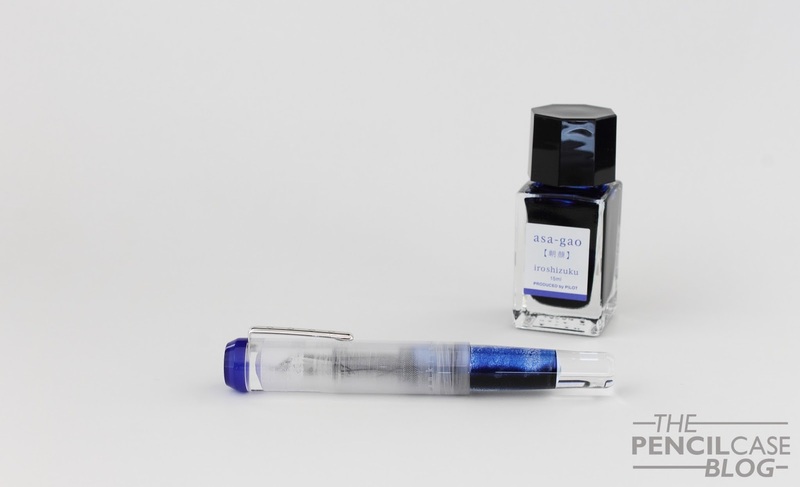 In the near future, it might become available through the Franklin-Christoph website directly, but of course there's also a number of other finishes available there. Price on the Pocket 40 with steel nib is 130 USD (About 116 EUR at the current rate), but of course it can be found cheaper on Massdrop if you can wait for the drop to re-open! 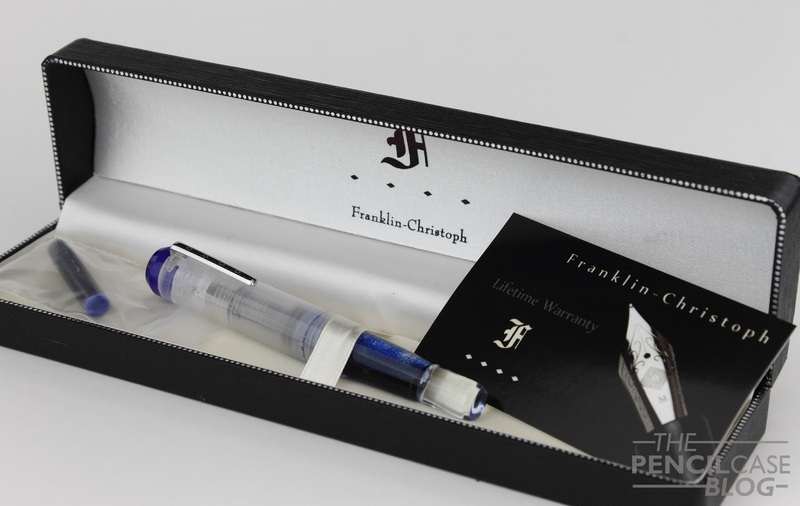 Want a Franklin-Christoph Pocket 40 fountain pen? Check out my giveaway HERE! Big thanks to the people over at Massdrop! Note: I received this pen free of charge from Massdrop, so I could write this review. I was in no way influenced in the making of this review, the opinions shared here are completely my own! This review does not contain any affilate links. A nice giveaway for a gorgeous pen.